This will be our third time doing the Canoe The Nonquon. Historical! 47th annual running. No portaging, all different ability levels, it's a lot of fun. 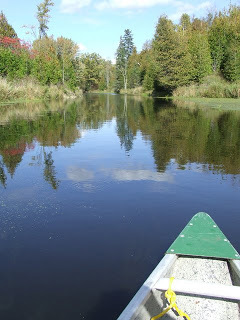 Starts in a twisty river, becomes a slightly less twisty river, and ends with a soul-destroying paddle across Lake Scugog. 2014 was a bit of an anomaly - due to low water, the race started 5km downstream from the normal start. Fewer twisty bits plus favourable lake winds mad it easier for us, and we actually won our division! 2013 was the full length and we really suffered into a brutal brutal headwind on the lake. Our average speed dropped to like 5-6km/h, although it felt a lot like 0km/h. Rough conditions, too, which given our relative inexperience at the time was distracting and slowed us down further! Not much fun. This year the weather is looking promising so far. Possibly a tail-wind on the lake? Or is that too much to ask for! Not entirely sure on the water levels, it rained a lot this past weekend but it was very dry before that, might not translate into much higher river levels.